Mix sour cream and next 6 ingredients. Marinate chicken breasts 4 hours or preferably overnight. Before baking, roll each piece in fine bread crumbs. Place in baking dish; dot with plenty of butter. Bake at 350 degrees for 1 to 1 1/2 hours. 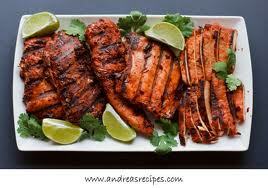 The marinated chicken breast recipe is ready to serve...nice ! Great ideas and it looks delicious. Thanks for sharing. I would try this at home. Have a great day.